Chalongphob Sussangkarn, president of a private think tank who criticized currency controls on foreign investors, was named Thailand’s new finance minister on Wednesday. 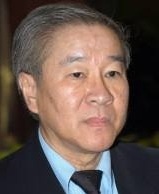 Chalongphob, a former member of the World Bank, is described by local analysts as a pro-market economist. “The most important need right now is to bring back consumer and business confidence in the economy,'' Chalongphob said after the appointment. Chalongphob formerly criticized the central bank's controversial currency measures as “too harsh,'' saying some short-term funds were needed to develop capital markets and urged the Bank of Thailand to cut interest rates to curb baht gains.